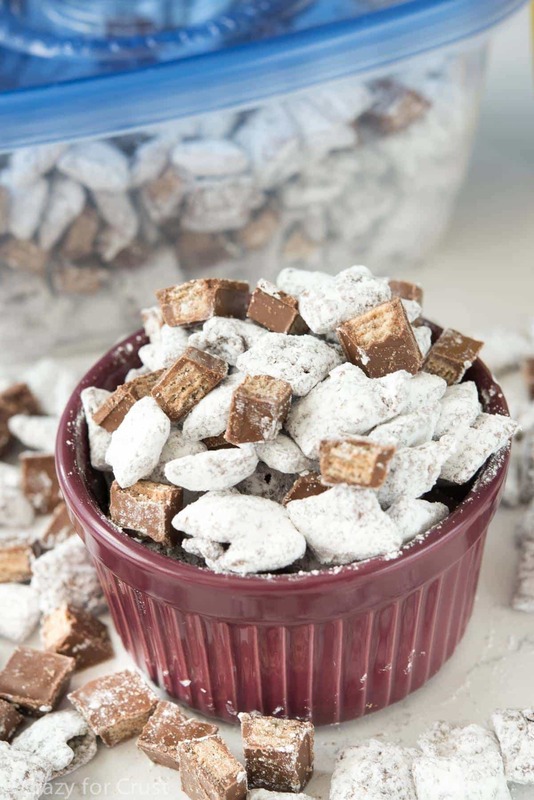 Kit Kat Muddy Buddies are an easy sweet snack recipe to whip up for your next holiday gathering! You guys, last weekend I spent over 2 hours actively shopping at Walmart. Mel and Jordan went to do some errands and I (stupidly) thought to myself I’ll just run and get a few things and then have a little me time. My family walked in the house about 20 minutes after I got home. But it was worth it: I’m almost done Christmas shopping! On a shopping trip after Halloween, I found Kit Kat Snack Size Bars on sale. You all know how much Jordan loves her Kit Kats, right? A few bags went into my cart because I knew, at some point, I’d find something to make with them. 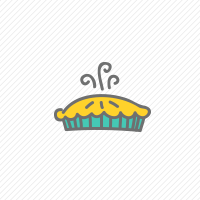 Then I started my holiday baking and I ransacked my stash. I do a lot of gift mailing at the holidays: between business gifts and out of town family I probably mail over 30 packages. Almost everything I mail gets a treat of some sort because, well, that’s just how I roll. Trying to decide what to make can be tricky; you don’t want something so fragile it’ll break (like a delicate sugar cookie) or something too gooey they’ll stick together (like a ganache brownie). I find that fudge, toffee, and snack mixes are the best things to mail. 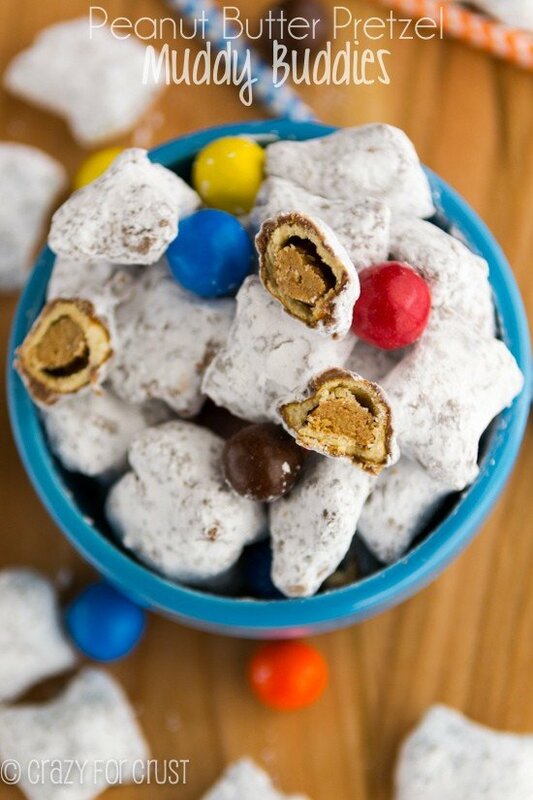 Of all the snack mixes in all the land, however, muddy buddies are my favorite. My favorite way to send muddy buddies, or any baked good, is in plastic storage containers like these Glad Food Storage Containers. I can never have too many of these containers in my kitchen. In fact, they’re all I buy. My storage drawer is filled to the brim with them! They’re reusable but they’re cheap enough (especially at Walmart) that if they disappear I can buy more easily. 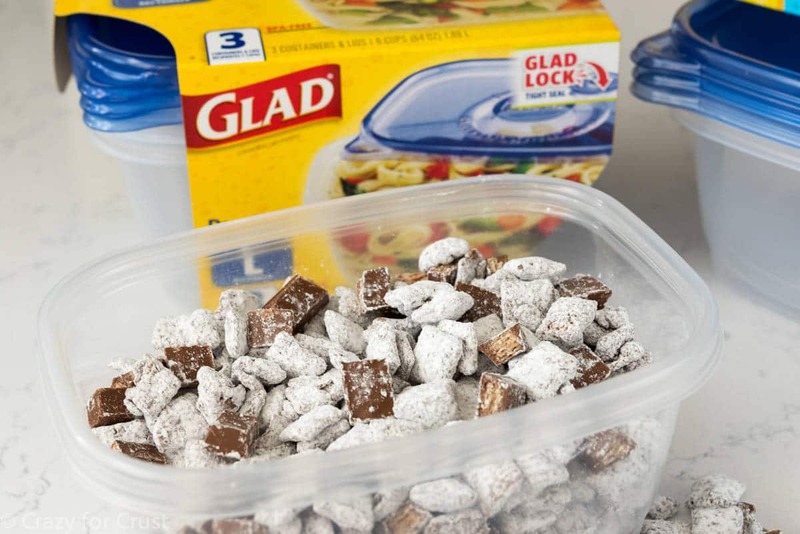 The large containers are also the perfect way to make muddy buddies. Add the chocolate coated pieces and some powdered sugar, then seal and shake. No mess! These Kit Kat Muddy Buddies are perfect for muddy buddy lovers and Kit Kat lovers alike. It’s totally nut-free (unlike regular muddy buddies), which makes it a great party treat or gift for those with allergies. I used Rice Chex, but you can use any Chex cereal you like. The cereal is coated with melted chocolate chips. You’ll notice it also calls for a little bit of vegetable oil. I add that in so that the chocolate will melt easier and smoother. Sometimes, especially in winter, I have extra trouble melting chocolate chips without them seizing. Adding some oil (vegetable, canola, or even shortening) makes it melt much easier. I highly recommend shaking the coated cereal in the powdered sugar in two batches, otherwise it won’t get fully coated. As with my snowball cookies, I always do a double shake to get the extra powdered sugar look you see in the photos. This makes them much prettier, but messier to eat, so do whatever you prefer! 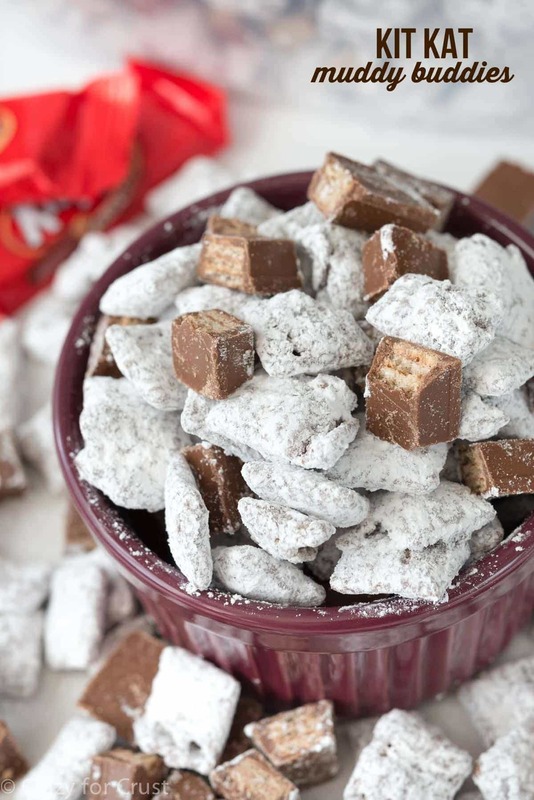 This Kit Kat Muddy Buddies recipe is so easy to make and totally foolproof! Plus, it makes a great party snack or homemade holiday gift! Place Chex cereal in a very large bowl. 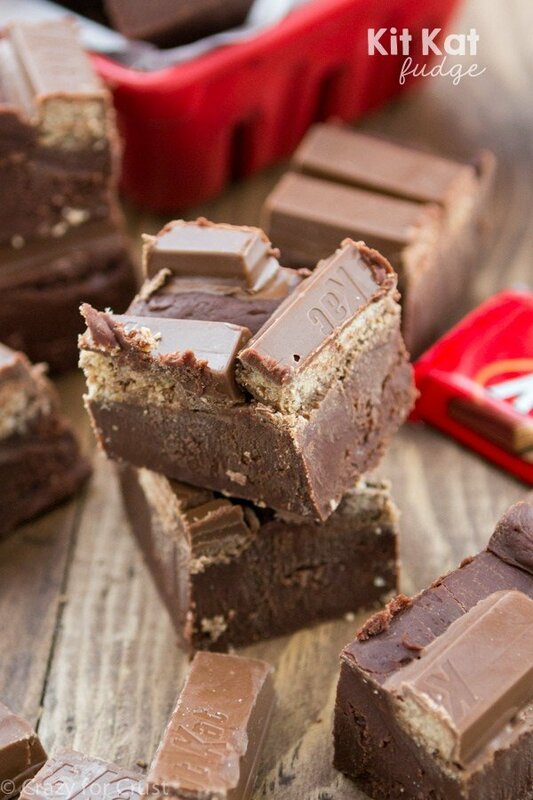 Unwrap Kit Kat bars. Finely chop 6 snack size bars (about 3 ounces). Break apart the rest of the bars and cut each bar into 4-5 pieces. Keep the two piles separate. Line a cookie sheet with parchment paper or a silpat baking mat. Place milk chocolate chips and oil in a medium bowl. Heat on high power in 30 second increments, stirring well between each, until melted and smooth. Stir in finely chopped Kit Kat pieces, then pour over Chex cereal. Toss carefully with a spoon to coat completely. Place 2/3 cup powdered sugar in a large gallon size bag or large Glad storage container. Add half the chocolate coated Chex, seal the bag or container, and shake to coat. Pour onto prepared cookie sheet, then repeat with another 2/3 cup powdered sugar and the rest of the chocolate coated Chex. Let sit until set, about 15-30 minutes depending on the temperature in your kitchen. 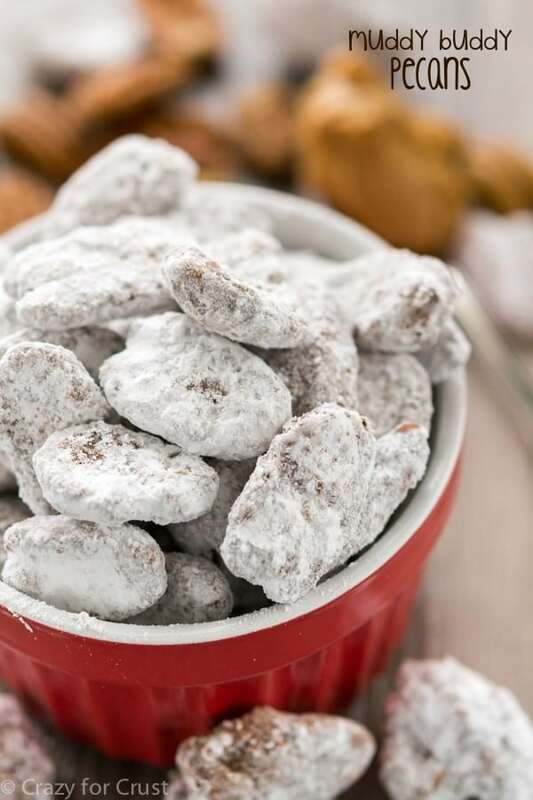 If desired, do a second coating of powdered sugar by placing remaining 2/3 cup powdered sugar in a large gallon size bag or large Glad storage container and add all the muddy buddies. Add chopped Kit Kats to cooled Muddy Buddy mix. Store in an airtight container for up to 1 week. I freaking love muddy buddies! I always eat way too much when I make it!!! Kit Kat’s make this fun snack mix so fun!!! oh wow!! this might be dangerous in our house!! I love those Glad containers, I pick them up at WalMart to keep on hand to send leftover home with our daughters – one is at college and the other has her own home, but doesn’t cook much. I think I need to make a batch of this to send with them this weekend! I love how great these are for shipping! Thanks Cheryl! I can never seem to get in and out of Walmart in less than an hour! I’m easily distracted. These look awesome, btw. I LOVE muddy buddies too!! I eat WAY too many of them when I have them though! This recipe is perfection Dorothy! Girl – I could definitely do some damage on a bowl of this! I could have spend hundreds of dollars on it all!! My husband loves Kit Kats – these don’t stand a chance in my house!